Every year in early November, Canaan Fair Trade organizes a little-publicized Olive Harvest Tour for visitors to Palestine to learn about farmers and their Fair Trade products. For eight days, six of us—all Americans—spent our days and evenings with host farmer families, exploring the northern part of the West Bank and enjoying delicious home-cooked Palestinian foods while experiencing the daily life and perils of Israeli military occupation for Palestinian farmers. The tour began at the Palestinian Farmers Union (PFU) in Ramallah, where we were briefed about the political economic context for farmers and agriculture. We learned that the “peace plans” put forward by U.S. Secretary of State John Kerry will transform Area C on the border with Jordan into a haven for labor exploitation, bringing in day laborers who will not be allowed to unionize and will be paid wages far lower than their Israeli counterparts. The PFU is concerned with Israel’s three-dimensional occupation that includes the water below the surface, the air above the earth, as well as the destruction and seizure of land owned by Palestinians. The hope for Palestinian farmers lies in finding creative and sustainable solutions for their produce by organizing their work through cooperatives and finding markets for their products. Following this hard-hitting dose of reality, our group proceeded to lighter activities—namely, visiting the Taybeh Brewing Company and a beer tasting. This was to be the first stop of many, tasting and sampling Palestinian foods and delicious beverages made by Palestinian producers. We drove through beautiful landscapes of olive terraces to Deir Ballout, a fair trade women’s cooperative, where we learned how to coucous-roll and enjoyed a coucous—called maftoul in Palestine—dinner with the women, with whom we stayed overnight. Canaan Fair Trade provides the women in Deir Ballout and other West Bank farms small business loans, or microloans. These are used to support smaller scale agricultural and husbandry activities such as growing zaatar (dried thyme), raising chickens, rabbits and doves, as well as commercial enterprises such as hand-making maftoul for sale. The old city of Nablus was our next stop, where we walked through the souk, stopping at various shops—the famous 200-year-old Nabulsi kanafe bakery (Palestinian cheese pastry soaked in sweet syrup), where we tasted manoushe bi-zaatar and bread with baked-in eggs. At the spice shop we smelled the essence of many dishes, and at the nut roaster we tasted pumpkin seeds, cashews, pistachios, almonds and hazelnuts that were roasted on-site. For a couple of hours we prepared stuffed grapeleaves and zucchini with the women of Bait Al-Karama of the Slow Foods Nablus movement. Our day ended with singing and the classical Arabic musical traditions of the ‘oud, darabekeh, duff, and tableh on a rooftop in Nablus. The next day we drove in the rain to the countryside and sipped strong, sweet tea and Turkish coffee beside the goats in a barn, picking olives when it stopped raining. 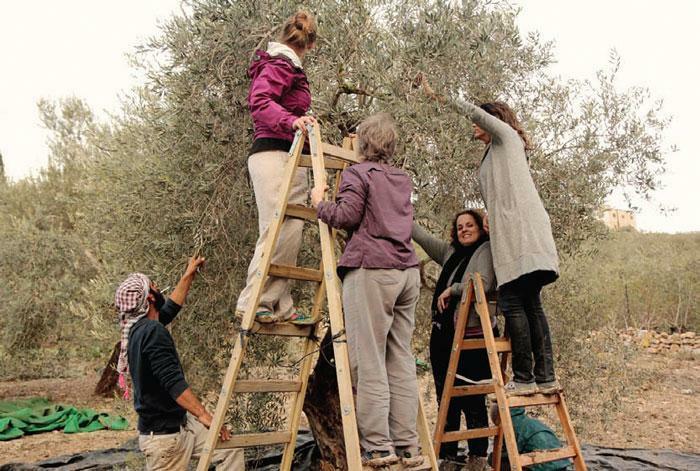 Men and women alike climbed the ladders up into the olive trees, carefully dropping the olives onto the tarp below, where they were gathered and sorted by the older women of the family. While picking olives, we watched as our dinner of a three-tiered rack of layers of chicken, vegetables and rice baked for two and half hours in a deep hole in the ground. A well-deserved and delicious dinner after laboring in the terraces! Further north, in Sebastia, we walked through the largest Roman ruins in Palestine, trying to avoid the attention of local students on an unescorted school field trip. We continued north to Jenin, the city where there has been much unrest and clashes with the IDF. There we enjoyed beef and chicken shawarma and falafel from a street-side café and visited the Freedom Theater to see its new play and watch the documentary “The People and the Olive” in its theater. This documentary (available from AET’s Middle East Books and More) is about a group of American ultra-marathon runners who crossed the West Bank planting olive tree saplings with farmers, and learning of their struggles. In Jenin, we met with the Palestine Fair Trade Association (PFTA) to learn about organic programs, certifications, future activities and the history of olive oil in Palestine. Although olive oil has been produced on this land since the times of Herod, farmers in Palestine today have few opportunities to access the global market, and face many challenges due to the destruction of trees, seizure of lands for settlements and living under occupation in general. Because Palestinian olive oil was not well known or appreciated on the international market, and individual farmers were unable to achieve the scale of production and quality specifications necessary to be globally competitive, the local market for olive oil was flooded and prices were low. Without a sufficient return on labor and investment, Palestinian olive farmers began to abandon farming as a means to support their families, which in turn posed a direct threat to food security. In 2004-5, the PFTA began educating farmers about the financial benefits of having their oil certified as organic and labeled as Fair Trade. Twenty farmers signed on. In 2004, the price of a kilogram of olive oil was around 8 shekels; through Fair Trade Certification, in just one year that price doubled to about 16 or 17 shekels per kilogram, providing the farmers with a living wage and income from their land. Eventually all the PFTA cooperatives received Fair Trade Certification in olive oil, and the first organic certification in Palestine. The path has not been smooth—there is competition from mass-produced olive oil from Italy and Spain. Palestinian olive oil was sometimes sold internationally as “from the Holy Land” and sold as Israeli. However, through the PFTA, Canaan Fair Trade was able to sell Palestinian olive oil as “Palestinian” abroad, while providing a fair price to the farmers. It is this combination of internal, grassroots connections with the farmers and an expertise in navigating export markets that makes Canaan Fair Trade so special and of such value to Palestinian farmers. We learned how the building of Israel’s apartheid wall and the seizure of Palestinian agricultural and grazing land impacted farmers and small landowners. Under constant threats from nearby settlers and restricted from access to their land by the IDF, these farmers are only able to pick their olives at certain times—and even those are not certain—and prohibited from bringing food or water or implements to prune their trees. While picking olives was still a beautiful and communal activity, the images of land divided by the wall, destroyed trees and distraught farmers permeated our thoughts. Every year, the PFTA farmers celebrate the end of the olive harvest at Canaan Fair Trade’s headquarters in Burqin in a festival called jaru’a. Last November was extra special because it was the Canaan Fair Trade’s tenth anniversary and Canaan invited 2,000 farmers. Our intrepid band of six joined the festivities, ate maftoul and chicken, debke danced to a band and listened to achievements of the past year. The final day of the tour was capped with a hike and picnic in the nearby hills to learn about the histories, plants and ecologies of the surrounding landscape. This trip gave me a deeper appreciation of organic agriculture and the transformative impact of fair trade on farmers’ lives and well-being. Canaan’s Jerusalem olive oil is available at Whole Foods stores. Its popular Nabali Tree and Rumi Tree Olive Oils are available from AET’s Middle East Books and More. Palestinian olive oil also is available for resale by interfaith groups and non-profit organizations, or through its website, <www.canaanfairtrade.com>. I would encourage anyone wanting to show solidarity with Palestinian farmers to consider joining the 2015 Olive Harvest Tour and to support Canaan’s sales in the U.S. in any way you can. The rewards are many—and some of them are very tasty, indeed! Randa Kayyali is the author of The Arab Americans and a postdoctoral research fellow at George Mason University. She recently received her Ph.D. in Cultural Studies.